Hello Fellow Gardeners! It's time to walk around the garden and see what has been blooming this past month. First, let me say, I was terribly wrong about April weather. I wrote on last month's GBBD in April, that I despised April here in Oregon as it's just plain old soggy. I swear, as soon as I wrote that post, the weather turned here. No rain. No joke. For nearly three weeks. It's just been in the past few days that we have had rain again. Craziness. I did not plan on hand-watering my newly transplanted botanical babies in April and with a few days reaching into the high 80's, it was nearly a plant disaster. The hot weather did propel blooms earlier, so I have a lot to show off this month. The rhododendrons were particularly fantastic. Below is Coral Mist. I brought it with me from our previous home. I've picked up a few new varieties of rhododendrons this year. So new in fact, I haven't bothered to write their names down yet! The peonies that came with the new yard have just begun to open. They have a softer pink exterior with a light, buttery inside. 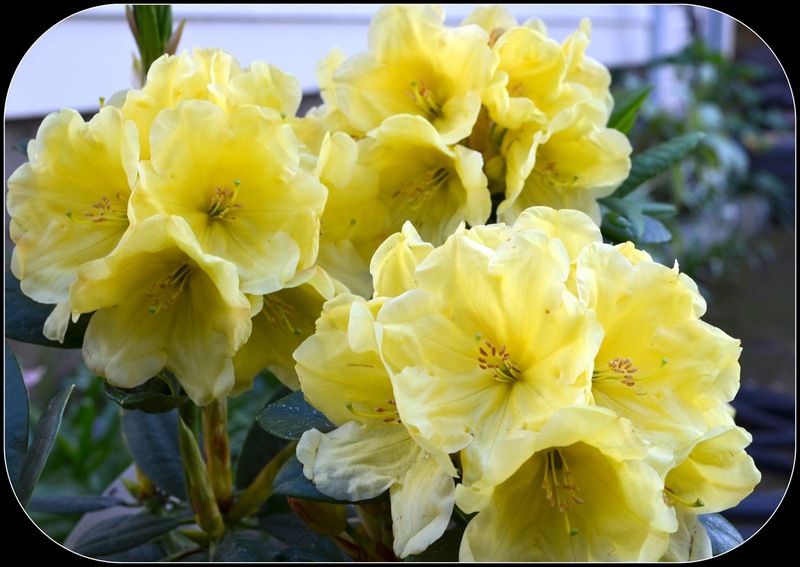 Last year, as I was working on remodeling the interior of the house, I would pick up new plants on occasion just to keep my spirits up and dream about creating new flower beds. I was particularly excited about putting in a traditional blue hydrangea. I've always wanted a blue hydrangea. I choose the hybrid version as it would keep the blue color and it is more compact in nature. Perfect for the spot I had in mind. An infant sized new shrub, that should grow much larger is Buddleja Globosa. Who can resist these fun orange ball flowers? Geum is a new plant for me this year. I loved that it had a long bloom period and thought the cheerful yellow - orange blooms would be welcoming in my front flower beds. 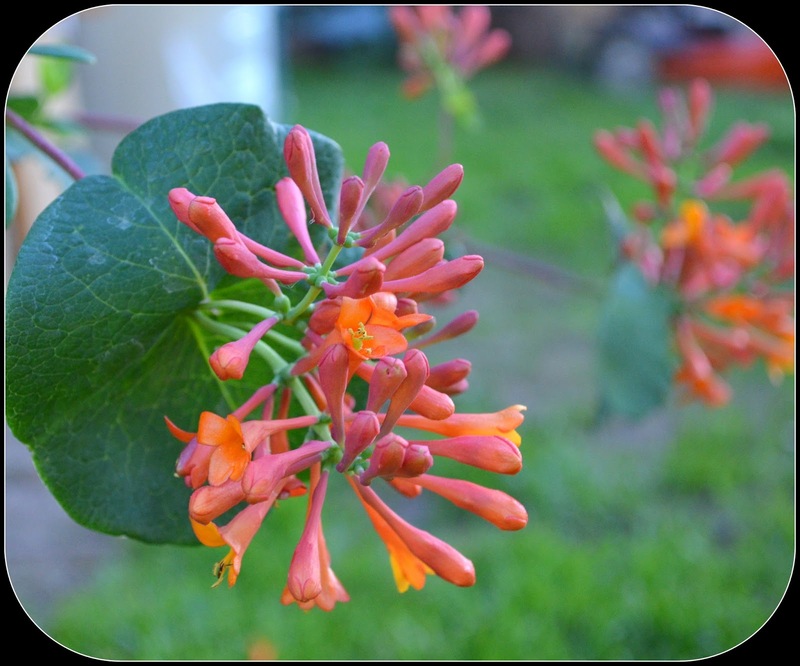 Honeysuckle has already begun to bloom. I'm looking forward to it spreading along the fence in the back and offering some privacy. It should make for happy bee's and hummingbirds too. A little red leaf sea thrift is gracing the edges of the front flower beds. I've always love this plant. I enjoyed it's green leafed version at my prior home and felt the red leaf variety was a fun choice to grow here. Soon, the asiatic lilies will be blooming along with my summer perennials. My goal is to have something blooming in the garden at all times, but that late spring/early summer window is a tough one. Any suggestions? Wishing you a Happy Garden Blogger's Bloom Day. Drop on over at May Dreams Garden and visit Carol and all the rest of the garden bloggers participating in this month's show of blooms. What a beautiful array of plants in your garden. 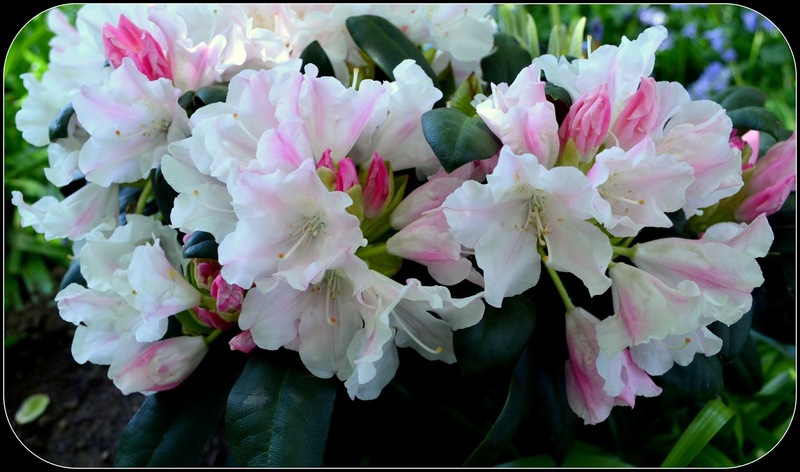 I particularly love your new selection of rhododendrons, I'm still waiting for mine to bloom here. I wonder if I tried that with my post I might get 3 weeks of dry weather LOL :) Those blooms are looking great and your Buddleja Globosa is a great choice for the garden. I wish I had room to grow one as it's so unusual looking. 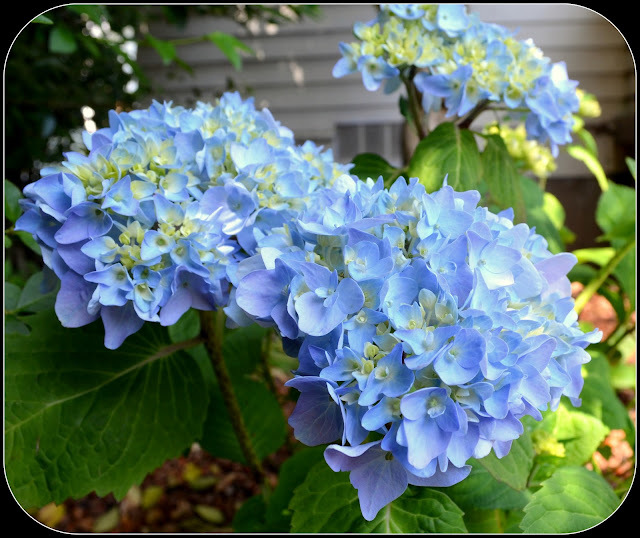 I especially like the Endless Summer Hydrangea - such a pretty blue. You have lots of pretty blooms! 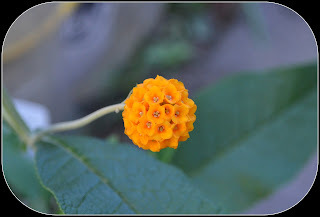 I've never heard of Buddleja globosa, got to check that one out, I love the little orange blooms on it. That Coral Rhodie is yummy too. 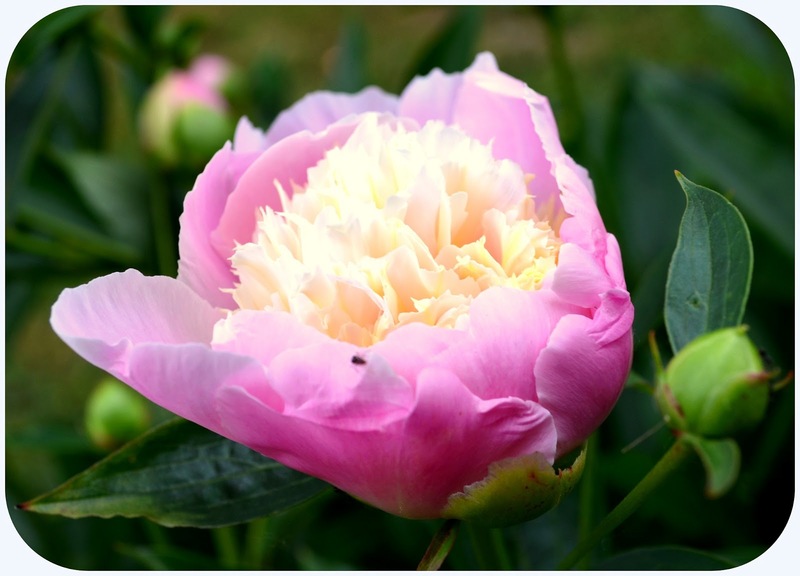 I think your peony may be 'Bowl of Beauty.' I love sea thrift too, I've been tempted by that one with the dark leaves. I have a LOT of the regular one already though. 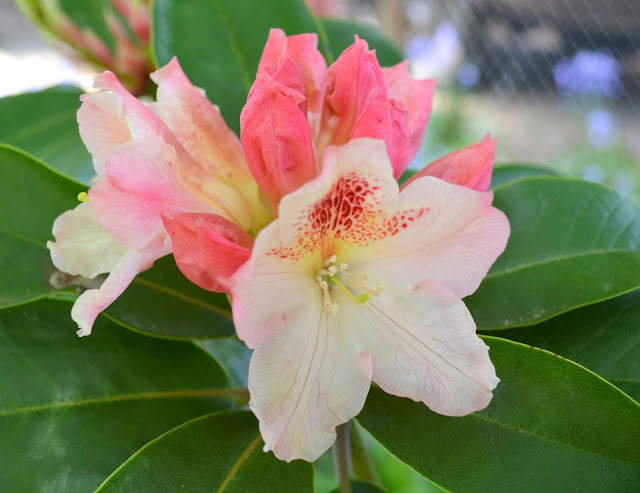 Wow...gorgeous Rhodies...I like that Coral Mist! Also..the pink honeysuckle is intriguing to me. I've only ever seen white/yellow varieties here. 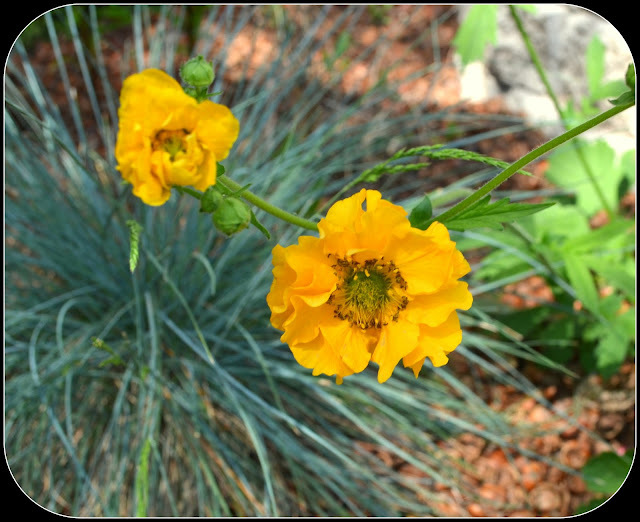 As for late spring/early summer blooming perennials...What about Coreopsis? I have a variety that I like, called Early Sunrise. I'm a huge fan of Farewell-to-spring (Clarkia) for last spring blooms. 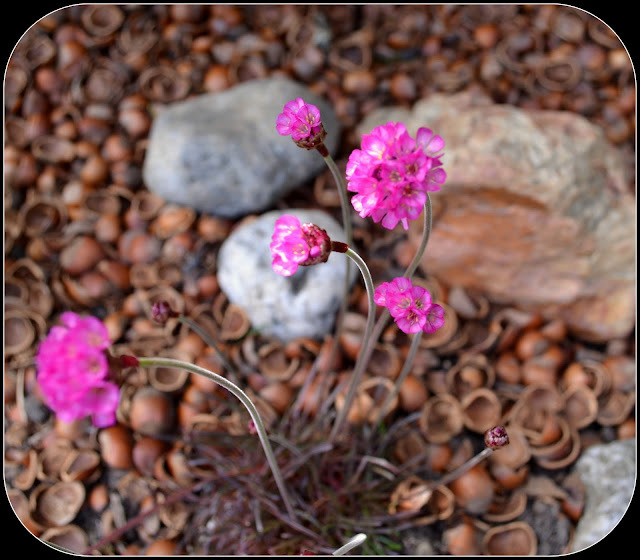 They are an annual but you can let them self-seed. But it looks like you're going to be just fine in the bloom department--everything looks great! I can vouch for the quick growth of the buddleja. Mine has quadrupled in size in one year, and it's even in a pot. I like phygelius and ceanothus for that time slot, but everything here blooms a little later that in town. Jenni, it's returning my comments again...so I hope that this time it goes through. Beautiful spring blooms! You are so way ahead of me here in London, we have had such a cold weather and everything is still very late. No paeonies or rhododendrons for me yet, might be weeks still. I loved the geum, don't grow them myself but I probably should, if I could manage to squeeze some in. Happy GBBD! Hey! A fellow Oregonian!! I live in the Willamette Valley now, but I was just a couple of towns away in my old house. I loooove the peonies and the blue hydrangea. Two of my favorite favorite flowers! I have thrift, but I haven't seen one with that foliage color. Very interesting! I'm intrigued by the buddleia as well -- does the flower just stay the small globe or does it get long cascades like the more classic buddleia? Great color! That dark-coloured Honeysuckle is particularly attractive. I can picture that growing over a rustic arch made of hazel boughs.. 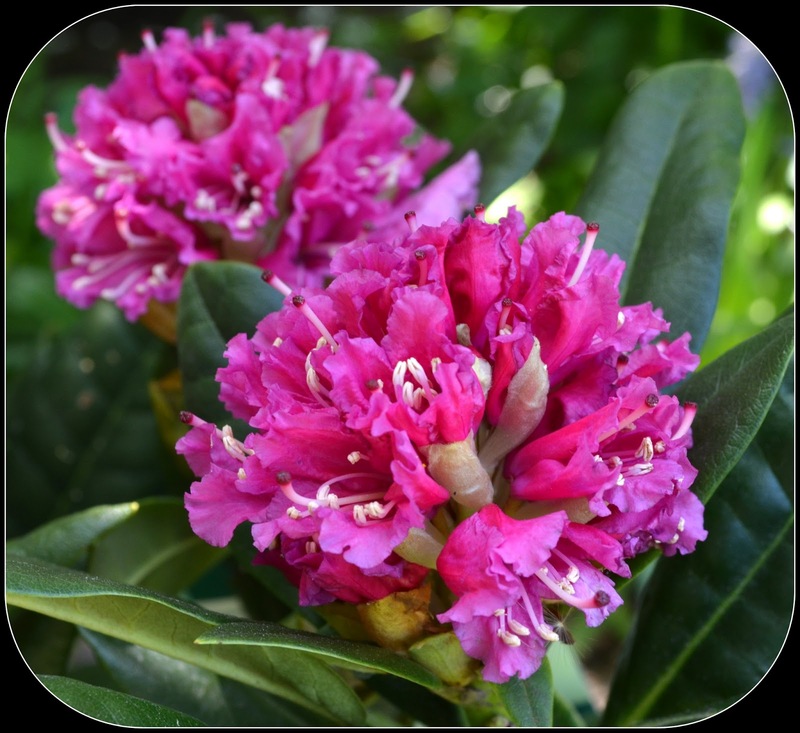 Your plants are far ahead of ours - except the rhododendrons which are in flower now. I love the Coral Mist variety. Wasn't April a total bear...all that heat and no rain...ugh! Looks like your garden is loving it, though...your hand-watering is paying off! LOVE the Hydrangea...it's one of the fabulous old-fashioned plants that I will TOTALLY grow when I have a bigger garden. I've always dreamed of having a house with a giant wrap-around porch, fronted with Hydrangea :-) Late spring/early summer can be fabulous...but the weather can really affect what's blooming, so even the best-laid plans can go awry. I've found Astrantia to be especially useful at this time...they are easy and bloom for quite a long time as long as you keep them moist. A bonus, when the flowers fade, the bracts got all papery and transluscent...looking great backlit...and they will re-seed generously!